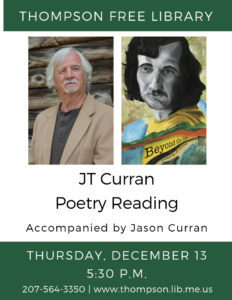 Thursday, December 13 at 5:30 p.m. Local poet and musician JT Curran will read from his volume of poems, “Beyond the Road,” accompanied by his son Jason Curran on the keyboard. From Matrika Press: JT Curran moved to central Maine in the early 1970s, drawn in part by the homesteading movement which resonated with many who sought a rural lifestyle and greater connection to the land. He built a log cabin on his twenty-two acres of wooded paradise and helped raise three children with his partner of forty-seven years. He has worked as a woodsman and a carpenter, has cultivated his own fruits and vegetables, and has volunteered with many civic and arts organizations. He holds an M.A in Counseling and has provided counseling service to many individuals and groups. He has taught courses in psychology at the University of Maine and Eastern Maine Community College, and has had a twenty-five year career in education as a guidance counselor. JT’s poetry blends colorful observations with thought-provoking reflections. With wit, compassion, irony, and humor, this book invites the reader to consider the signposts, off-ramps, co-travelers and vistas which populate our journeys. JT’s words reminds us that however we may navigate our experiences, our destination remains beyond the road. Selected from collected works which span over fifty years, “Beyond the Road” is JT Curran’s first published volume of poetry.